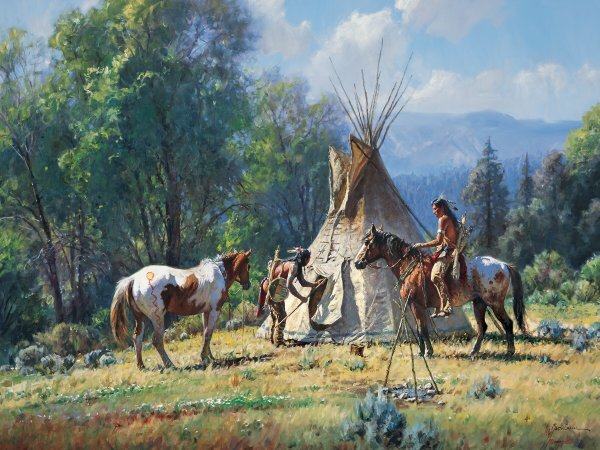 Martin Grelle's amazing ability to tell a story on canvas is legendary. This image is another outstanding story. Two braves cautiously approach what appears to be an abandoned teepee. As one of the braves slowly pulls back the cover on the doorway of the teepee, he carefully looks inside, but finding no life there. With the empty teepee and the campfire out, these braves can only wonder what caused its inhabitants to abandon their home. Satisfied that no one is in the camp, the braves will be on their way to journey through the mountains back to their own lodge.